Last summer, after years of yearning, we finally bought a van and have been slowly fixing it up, attempting to make it adventure ready. We’ve received a fair few e-mails and comments about the vehicle and our progress so we thought we’d share as much as we can here on our logbook for anyone interested. In a short space of time, the story has grown long, so we’re writing this in three instalments; this one being the first. If you have any questions or insights to share, (or you want to come and help us fix up the van!) then just e-mail us and we’ll be glad to hear from you. We're sure there are very few outdoors folk that haven’t longed for a van at some point in their adventuring careers; even if not for living the full-time #vanlife dream, then for having sufficient space to transport camping gear, somewhere warm to change post surf or somewhere to occasionally bed down for the night when finding a suitable place to pitch a tent becomes impossible. For the past few years we have yearned for our own home on wheels, yet living in the woods and teaching workshops however has meant we’ve needed a 4x4 vehicle for transporting materials, tools and people into our woodland site. 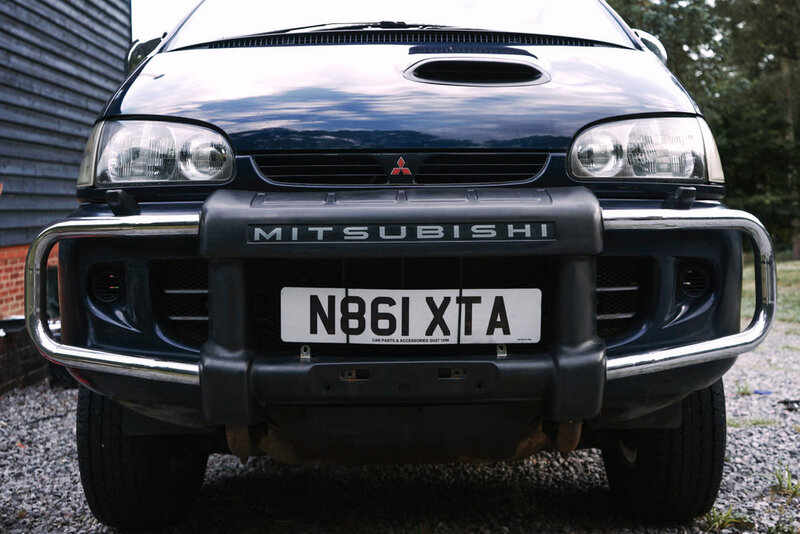 If only there was a vehicle big enough to satisfy our campervan yearnings yet rugged enough to tackle our offroading requirements…Behold, the Mitsubishi Delica! For those that don’t know, the Mitsubishi Delica is a Japanese import 4x4 people carrier. It comes in 7 or 8 seater versions, in both of which the seats can be folded, swivelled and adjusted in countless ways allowing all the seats to be folded flat into a full sized sleeping platform or out of the way to allow for a huge cargo area. Underneath the people carrier shell is the chassis and drivetrain of the Mitsubishi Pajero, a highly regarded, reliable, capable off-roading machine. The Delica is tall and narrow with high ground clearance, is equipped with a compass, inclinometer and bull bars as standard hinting at its intended use. We have had the Delica on our radar for years, drawn by its slightly ludicrous visual appeal, our penchant for Japanese goods having lived in Japan for 2 years, its versatility and the fact that due to its layout and design the Delica could be used as a respectable adventure vehicle without having to undertake any conversion work. The opportunity arose recently to bite the bullet when one was advertised locally for cheap; it had numerous (known) faults, including a massive dent in the sliding door, flashing 4x4 select lights on the dash, and plenty of cosmetic blemishes, but we were excited about trying to liberate the hidden adventuremobile within. I wrote “known” in parenthesis because it didn’t take long before we discovered many new, unknown faults. The first day we had the van, we tackled some of the cosmetic chores; back-to-blacked the front nudge bar and fitted a new Mitsubishi sticker, painted the intercooler intake, window wipers and anything else black that was supposed to be black, ripped out the stained grey carpet and fitted a new one and thoroughly scrubbed and cleaned the interior and exterior. Feeling pretty pleased with our efforts, our hearts sank when we couldn’t get further than 5 minutes away from our house without the engine cutting out. We also had squealing belts, black smoke and flashing lights on the dash that weren’t there when we bought the van. Our trusted local garage gave it a full service discovering even more issues, that were luckily easily fixed, but the intermittent cutting out couldn’t be resolved. 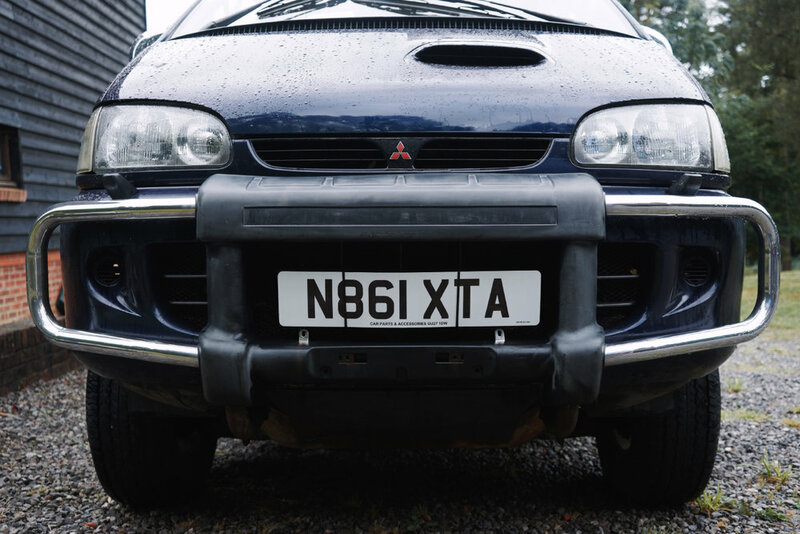 Enter the Mitsubishi Delica Owners Club Forum, where after a little looking around we diagnosed the problem and found a specialist who came out and got us back up and running. Not having a great deal of spare cash to pay for frequent repairs, we quickly realised the forum was going to become a very frequently visited site and that like many members on the forum, we were going to have to get comfortable with fixing mechanical issues ourselves. With the help of the forum, some advice, reassurance and borrowed tools from Andrew's Dad, who's a retired motor mechanic, we rolled up our sleeves and got to work. We fitted an EGR blanking plate, which cured the black smoke, replaced the 4x4 vacuum solenoid which remedied the flashing lights and got the 4wd working again, bought a replacement sliding door which we stripped, resprayed and fitted and fixed the sliding door roller mechanism with a skateboard wheel bearing. Although working on cars is a totally different experience to woodworking, you're left with the same sense of satisfaction when you solve a mechanical problem as you get when you've made something from scratch from wood with your bare hands. It has been frustrating at times, the list of problems never seems to get any shorter, and we're slightly envious of those a can afford a newer trouble free vehicle (if there is such a thing), but this old van has given us the opportunity to learn yet another new skill, to further develop our self reliance, and all the challenges we've overcome so far have become part of the story, part of the adventure. In the second part of this post, coming next week, we’ll share more of our mechanical misadventures and successes, introduce the beginnings of our camper conversion and tell the story of our first trip.